Pentangle were a British folk rock band who had their best period in the late sixties/early seventies. They were largely folk-based but had influences of blues, jazz and rock in their music too. This is a pretty good compilation that serves as an introduction to their music. The differing eclectic nature of their music can be clearly detected when listening to a few tracks from its thirty-one available. The traditional folk of "Let No Man Steal Your Thyme" is a very Fairport Convention-esque track, with Jacqui McShee providing haunting, medieval-style vocals, whereas "Waltz" is an instrumental packed full of jazz influences - stand up bass, jazz drum rolls and lively keyboards. It on tracks like this that Pentangle differed from many other folk groups. "I've Got A Feeling" is ethereally folky, yet it also sounds very Janis Joplin-esque in its bluesiness. Underpinning it though, is another irresistible jazz percussion rhythm. The bass on here is sublime. This jazz part of their sound made them quite unique. "Three Part Thing" is an instrumental with a very Eastern guitar sound that was very popular in the late sixties. "Bruton Town" is a traditional folky air, with McShee and Bert Jansch duetting most hauntingly. The bit where it goes quiet and the guitar and drums interplay is excellent. The musicianship is of the highest quality. "Lord Franklin" has Jansch on vocals in a moving sea-faring tale. McShee's backing vocals are beautiful, as is the guitar. "Once I Had A Sweetheart" is again, very Fairport Convention-like in the Sandy Denny-style vocal delivery and overall feel. The bass is sumptuous on it too as is the Eastern-influenced rock guitar at the end. Like something The Doors would do. 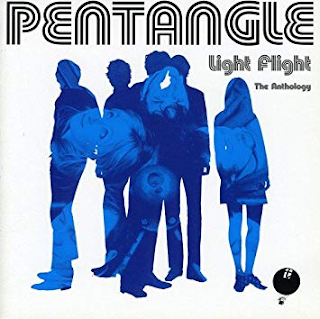 "Light Flight" is possibly their best-known track and is jaunty and jazzy in its instrumentation, but harmoniously folky in its airy, floaty "dah-dah-dah-doo-dah" vocal improvisations. The acoustic guitars in it are seriously impressive, as is the shuffling drum rhythm. It is quite infectious. Another favourite of mine is "A Maid That's Deep In Love", a fascinating story about a girl who goes to sea dressed as a man and the short, enjoyable, finger-pickin' country rock of "Cold Mountain". The live cut of "Goodbye Pork Pie Hat" features some killer blues guitar that early Fleetwood Mac would have been proud of. This provides just a sample of the sort of material on this excellent compilation that provides a worthy introduction to the music of this often-forgotten, but actually very influential, ground-breaking group.